ArvinMeritor Inc.'s Light Vehicle Systems business group supplies the Porsche Cayenne GTS optional slide and tilt sunroofs and a panoramic opening sunroof. The panoramic roof features large laminated panels from PPG Industries Inc. For the panoramic sunroof, sheet metal was replaced with composite materials making weight savings of up to 4.5kg (about 10 pounds) per vehicle. ArvinMeritor also designed the panoramic sunroof to be incorporated into the supplier's long-fiber injection (LFI) roof module, facilitating integration with other components such as the antenna and roof beams. ArvinMeritor expects a 20 percent fitment rate for this product. Brose Fahrzeugteile GmbH & Co. KG delivers the complete doors and seats from its German factories in Coburg and Hallstadt respectively. The Germany supplier reports that the main reasons it won the contracts were the flexibility of its electrically adjustable six-way seat structure and its experience working on other Cayenne models as well as its platform mate, the Volkswagen Touareg. 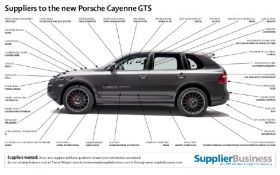 The Cayenne GTS was designed to be more agile and give better road performance than other members of the Cayenne range. Under the premium SUV's hood sits a 4.8-liter, 405hp V-8 direct fuel injection engine. A key safety feature of the GTS is Porsche's Dynamic Chassis Control (PDCC) system, which is less adversely affected by the road surface than conventional designs. The new system uses hydraulic swivel motors in the front and rear axles to control the antiroll bars. Seven sensors -- which together monitor wheel movement, lateral acceleration, steering and road speed -- provide information to regulate how and by how much force should be applied to the bars. The power of the PDCC system is driven by Ixetic GmbHs a high-pressure hydraulic pump, which can react in milliseconds and can create pressures up to 2,610 pounds per square inch, enough to counter lateral forces up to 0.65g. Cooper-Standard Automotive Inc. supplies the system's high-pressure tubes. Porsche assemble the GTS at its plant in Leipzig Germany. The GTS starts at 78,755 euros in its German home market.